Planters, drills, and air seeders have to cut and handle residue, penetrate the soil to the desired seeding depth, establish proper seed-to-soil contact and close the seed-vee. Keeping these four items in mind, a producer can evaluate the strengths or weaknesses of any piece of planting equipment and make any adjustments or changes necessary to make no-till successful. Fortunately, most currently available planters and drills can be used for no-till with few, if any, modifications. Double disk seed furrow opener showing the recommended 2 inches of blade contact. No-till planter with heavy duty down pressure springs and spoked residue movers to move residue, but not soil. Planters and drills are built with large diameter, disk seed furrow openers, making no-till easy. The disks are made of thick gauge steel for strength and wear. Check the double-disk seed-furrow openers on the planter, before the planting season, for wear and proper adjustment. The individual disks can be adjusted inward as they wear by removing spacer washers from behind them. This keeps the two blades of the seed-furrow opener working together as one cutting edge, making a coulter unnecessary. If the two blades are mounted side-by-side, like on John Deere, Kinze, and White planters, they should have about two inches of blade contact on the leading edge. On staggered disk seed-furrow openers, like on Case-IH, Deutz Allis, and Landoll planters, the rear disk should be tucked in behind the leading disk, just touching. Adjust the disks or replace them to maintain the proper configuration. When properly adjusted, these seed-furrow openers can easily cut residue and penetrate the soil without coulters or row cleaners. 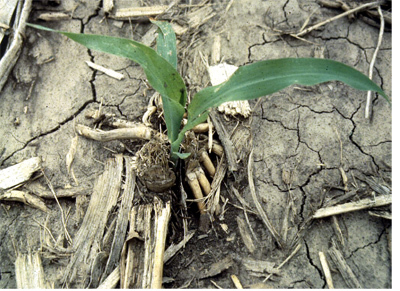 On well drained or highly erodible soils, the residue should be left over the row to absorb raindrop impact. This will reduce erosion and crusting in the row, and provide a mulch to reduce drying of the seed zone. On flat, poorly drained soils, "spider wheel" row cleaners could be used to move the residue off the row to aid in soil drying. Those with back-swept teeth work better for moving heavier residues, like irrigated corn residue. Unlike disk row cleaners, the spider wheels can be set to move only residue. Floating residue movers with depth bands help keep the surface more uniform, reducing soil movement. However, wind may blow some residue back over the row, interfering with emergence or causing plants to leaf-out under the residue. When the residue is not moved, the seedlings will come up through the slot cut through the residue when the seeds were placed. If soil is moved at planting, any previously applied herbicides could be moved out of the row or the crop may be planted deeper into cooler soil. A furrow could be formed which may wash out or crust over. In addition, if the soil is wet under the residue, soil disturbed by row cleaners or coulters will stick to the planter's depth gauge wheels and other components. As such, many no-tillers do not use residue movers, allowing the planter to run on a layer of residue to avoid problems. Drills, air seeders, and hoe opener drills have increased their spacing and stagger, often changing to multiple ranks of openers. These improvements have helped residue flow. Usually a smooth residue cutting coulter is added in front of hoe openers to slice through the residue. Narrow chisel points on air seeders open the seed-vee, cutting through the dry surface layer without detaching as much residue as sweeps. Often, residue detached by the front ranks of openers tends to plug the rear ranks. Several brands of drills and air seeders now use large-diameter, single disk openers to cut through residue with far less soil disturbance. Corn plant growing up through corn root ball of the previous crop. Use added weight and downpressure springs to ensure penetration of the residue and soil to the proper seeding depth. Getting the seed down through the residue and into the soil is the second important step of the planting process. The seed must be placed in moist soil, at a depth suitable for proper rooting and growth, 2 to 3 inches for corn. The depth control is usually set deeper than normal because the depth gauge wheels are riding on a layer of residue. To ensure penetration to desired seeding depth, downpressure springs may be needed to transfer weight from the planter toolbar to the individual row units. There must be sufficient weight on the units to keep the depth gauge wheels in firm contact with the ground to control planting depth. If the gauge wheels are loose, tighten the downpressure springs or add heavy-duty springs. In addition, there needs to be enough total weight on the toolbar to keep the planter drive wheels in firm contact with the ground to prevent slipping and to help keep the planter on the row. Having enough weight becomes more of a problem with drills simply because of the number of rows per unit width. For instance, a six-row planter on 30-inch row spacing may require more than 3,000 pounds of weight just for cutting the residue and penetrating the soil (six rows times 500 pounds per row). A drill of the same width on 7.5-inch row spacing has 24 openers and may require more than 12,000 pounds. 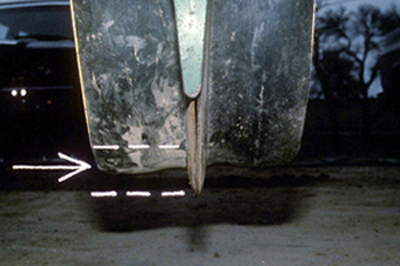 Air seeders often use the downward "suction" of the chisel points to aid in penetration. However, weight may still have to be added, especially on those that use the large diameter, single disk openers and on those that use an air cart to carry the weight of the seed and seeding mechanism. Using a 10-, 12-, or 15-inch row spacing decreases the amount of weight required and reduces equipment costs. Sufficient weight must remain on the press wheels to ensure firming of the seed into the soil. Wet soil is easily compacted and care must be taken not to over pack the soil, making it difficult for seedlings to emerge or for the seedling roots to penetrate the soil. Likewise, too much weight on the depth gauge wheels may cause sidewall compaction in wet soils. In dry soil conditions, extra downpressure and closing force may be needed. The key is to evaluate seed-to-soil contact, not the top of the seed-vee, when setting the downpressure on the press wheels. As long as the contact is there, the downpressure should not be increased. Something as simple as a harrow that acts to close the top of the vee and pull light residue cover back over the vee may be all that is needed. This is a common practice on drills that use a narrow press wheel in the bottom of the seed-vee to get seed-to-soil contact. Keeton Seed Firmers or Schaffert Rebounders, usually attached to the seed tubes, can help make sure all the seeds are placed in the bottom of the seed-vee. These devices usually pay for themselves by providing a more uniform crop emergence, particularly if seed bounce is a problem in rough fields or at higher planting speeds. Both of these devices have options to put a "pop-up" fertilizer in the seed furrow, recommended to help early growth in no-till, especially in cooler soils. A separate opener could be used to place the starter fertilizer beside the row, required if the equivalent salt content of the fertilizer would damage the seed. However, another opener would disturb more soil and residue, possibly drying out the seed zone and affecting depth control, and would require more weight and downpressure. If extra help is needed to close the seed-vee, spiked, curved tine, or lugged closing wheels can be used to "till" the seed furrow closed and reduce sidewall compaction. The downpressure on the closing wheels has to be reduced so as not to till the seed out of the seed furrow. Some producers put on only one spiked closing wheel per row so that the remaining standard press wheel provides depth control while the spikes crumble the sidewall. 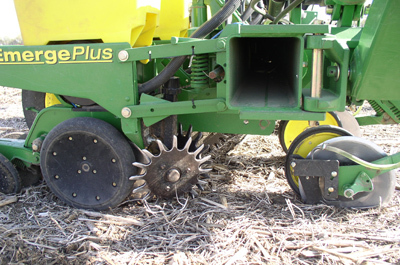 While effective at closing the seed furrow and tilling in the sidewall, these spiked attachments often do not provide sufficient seed-to-soil contact and should be used in conjunction with a seed firmer. The tillage may leave the soil loose above the seed, allowing the seed zone to dry out. A drag chain or wide press wheel behind the closing wheels can be used to firm the soil to reduce soil drying. With appropriate weight, downpressure, and adjustments, most current planters and drills will perform well in no-till conditions. A little time spent in the early spring will help avoid headaches and delays later during the planting season.